the Adventure Plateau has something for you. Welcome to Haven's web site. 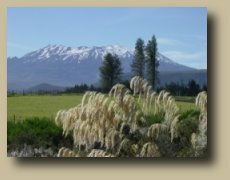 Haven is nestled between the Tongariro National Park and the Whanganui River National Park, just a few hundred metres to the Tongariro Forest at Raurimu. The immediate area is rich in history, forests, rivers and streams, and mountains to explore. Haven provides a base for an awesome array of outdoor activities all year round. Clean,tidy and plenty of room. 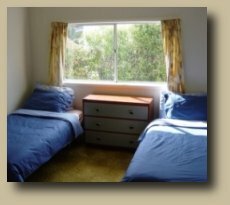 Two queen bedrooms, 2 twin bedrooms, and one single bedroom. Duvets, extra blankets and pillows provided. Come and make the most of the "Adventure Plateau", with Haven as your base. In Spring/Summer you can sit out on the large deck and watch the sun go down over the flowering dogwoods, with the river babbling in the background and warbling tuis and bellbirds doing their last rounds. When it gets cooler,snuggle up around the fire with a glass of mulled wine and a good book, play cards or darts etc., or bring along your favourite DVD's. For the more active, Haven is nestled between the world heritage Tongarairo National Park, Tongariro Forest Park, and Raurimu Scenic Reserve, and only a stones throw away from the Whanganui National Park, Haven offers an awesome base for your Central Plateau adventures. 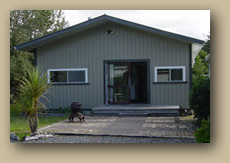 Raurimu is home to the world famous Raurimu Spiral (you can watch the trains on the second level from the front porch of Haven), and is only 20 minutes to Whakapapa ski field, 40 minutes to Turoa ski field, and about 20 mins to the nationally renowned Taumaranui Golf Course. But wait,there's more (sorry, no Ginsu knives), the Central Plateau offers a whole lot more: the best mountain biking in the North Island (42nd Traverse, Fishers Track, John MacDonald Loop), skiiing, snow boarding, mountain climbing, hot pools (Tokaanu), climbing wall, trout fishing, horse riding, quad biking, paintball, tramping, kayaking, rafting, scenic flights, natural history, hiking, canoeing, easy day walks, art & crafts, restaurants, pubs, Lord of the Rings filming locations, Waiouru Army Museum, Tongariro Crossing, summit climbs, bird watching, .... it's brilliant. Get out of the city - Haven is an awesome place for you, and your kids, to experience a wicked range of outdoor activities.